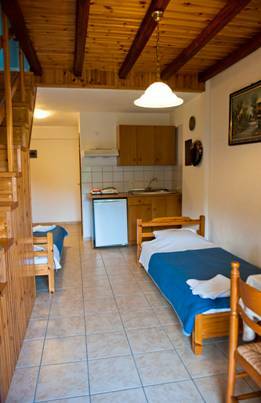 The accommodation comprises of 15 apartments including 4 maisonettes. 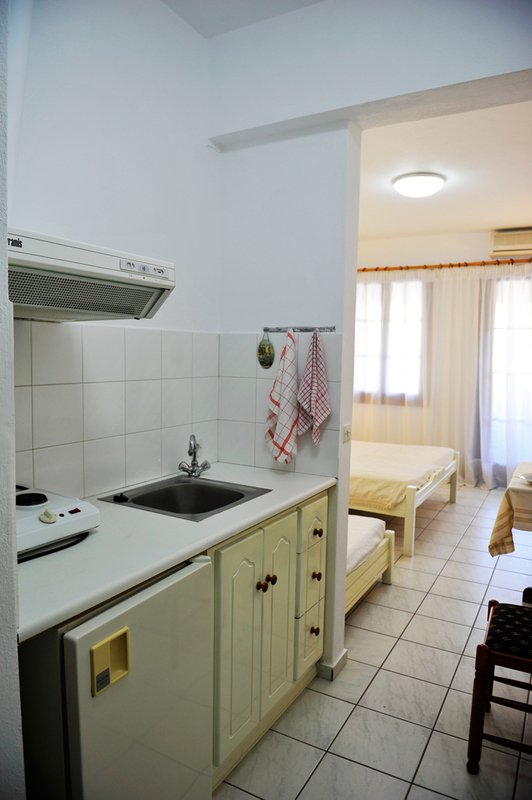 Each room has a fully equipped kitchen, bathroom and private balcony. 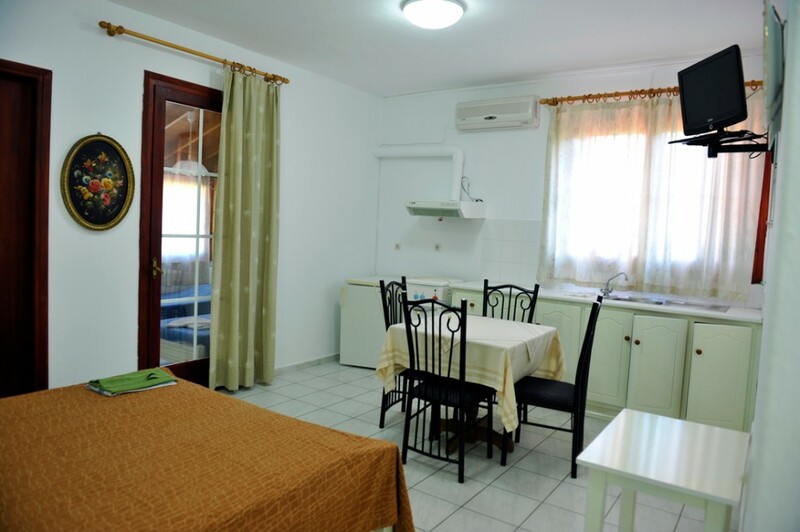 Air Conditioning, TV, FREE WiFi and telephone facilities are also provided. Bookings include a hearty breakfast to start your day. There is also a large swimming pool with all day sun with relaxing sunbeds and umbrellas provided. Greek, English, German and Italian are spoken. 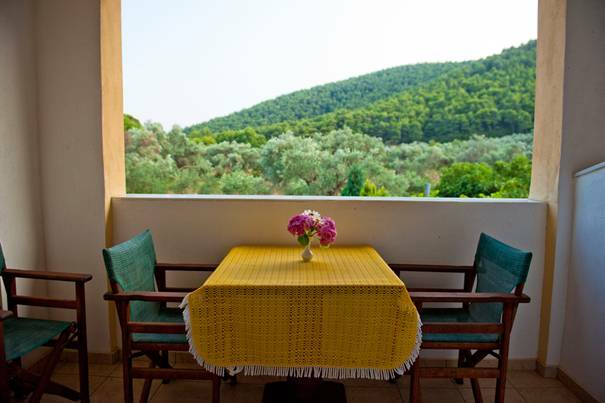 Situated in a quiet corner of the Aselinos Valley, just 13 KM from Skiathos Town and 250 metres from the sea, Villa Angela offers Greek hospitality and comfortable rooms in peace and tranquility where you can truly relax. Surrounded by forest and beautifully kept gardens abundant with flowers and home produce, Villa Angela is the ideal pace to experience Skiathos to the full. A short walk brings you to the lovely, clean waters and sandy beach of Aselinos. A car is recommended to get to Villa Angela and also to visit the more remote and beautiful parts of Skiathos. Pasquale can arrange a hire car if required. Alternatively there is a really pleasant walk to the main road where buses run regularly in and out of town and to the array of magnificent beaches, supermarkets and eateries that this island has to offer. For nights out, taxis can be booked in advance from local friendly transport providers. Leave Skiathos Town in the direction of Koukounaries. 10 KM along the road, take the right fork for Aselinos. After 2.5 KM, take the left fork for Aselinos and you will find Vila Angela 1 KM on the left. Welcome to Villa Angela apartments. Villa Angela is a family run business that has steadily been \ established and developed since 1996. Giovanni Angela and their son Pasquale are here to tend to your every need and to ensure your stay is fun-filled and a holiday to remember. With a mix of traditional Greek and Italian with a little german culture thrown in, the hospitality, cuisine and family atmosphere is second to none. Prices are per room per night including breakfast. Reservations will only be confirmed by email once a deposit has been received. Villa Angela is open ALL YEAR.